Part of the fun of Halloween for me is decorating. I love putting out pumpkins and ghosts and all that kind of thing (even though I hate having to take those decorations down come November). 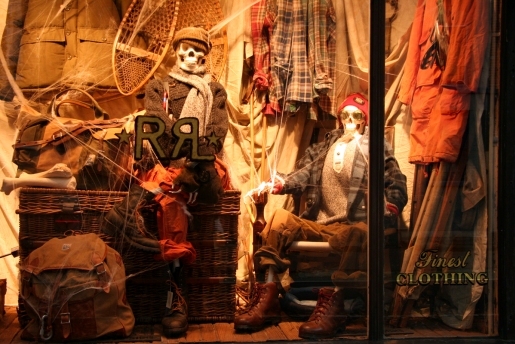 While I never worked in retail during the winter holiday season, I can appreciate a good Halloween window display, and the Bleeker Street Ralph Lauren stores in New York’s West Village have some incredible window displays focusing on both fashion and fright. Sometimes I’ll go to the mall or down to the fancier parts of town and see those big window displays and just marvel. Not so much at Halloween, but usually Christmas. I love how they look, and I know that, if I worked there, I’d hate having to set it up, but to get to come up with the ideas for the displays would be awesome. Is there a full time job that just thinks up window displays for various stores?